We’re grateful for the laughter, love, & great memories that Robin Williams brought to ours & so many others’ lives. 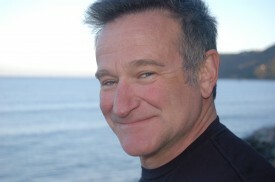 We watched Mork & Mindy as kids, Dead Poets Society & Good Will Hunting as young adults, & introduced our son to him with Aladdin & Patch Adams… the world has lost a bright & brilliant light. Nearly 1 million people commit suicide each year worldwide — about 1 death every 40 seconds or 3,000 per day. For each individual who takes his/her own life, at least 20 attempt to do so. PLEASE, take a couple minutes to read the risk factors & warning signs of suicide from the American Foundation for Suicide Prevention below, TALK to the people in your life about suicide (even if it’s uncomfortable! ), & share the suicide hotline: (800) 273-TALK (8255). Protective factors for suicide are characteristics or conditions that may help to decrease a person’s suicide risk. While these factors do not eliminate the possibility of suicide, especially in someone with risk factors, they may help to reduce that risk. Protective factors for suicide have not been studied as thoroughly as risk factors, so less is known about them. Protective factors may reduce suicide risk by helping people cope with negative life events, even when those events continue over a period of time. The ability to cope or solve problems reduces the chance that a person will become overwhelmed, depressed, or anxious. Protective factors do not entirely remove risk, however, especially when there is a personal or family history of depression or other mental disorders. In contrast to longer term risk and protective factors, warning signs are indicators of more acute suicide risk. Thinking about heart disease helps to make this clear. Risk factors for heart disease include smoking, obesity, and high cholesterol. Having these factors does not mean that someone is having a heart attack right now, but rather that there is an increased chance that they will have heart attack at some time. Warning signs of a heart attack are chest pain, shortness of breath, and nausea. These signs mean that the person may be having a heart attack right now and needs immediate help. As with heart attacks, people who die by suicide usually show some indication of immediate risk before their deaths. Recognizing the warning signs for suicide can help us to intervene to save a life. Individuals who show such behaviors should be evaluated for possible suicide risk by a medical doctor or mental health professional. •	50% to 75% of all people who attempt suicide tell someone about their intention. •	If someone you know shows the warning signs above, the time to act is now. •	Begin by telling the suicidal person you are concerned about them. •	Tell them specifically what they have said or done that makes you feel concerned about suicide. •	Don’t be afraid to ask whether the person is considering suicide, and whether they have a particular plan or method in mind. These questions will not push them toward suicide if they were not considering it. •	Ask if they are seeing a clinician or are taking medication so the treating person can be contacted. •	Actively encourage the person to see a physician or mental health professional immediately. •	People considering suicide often believe they cannot be helped. If you can, assist them to identify a professional and schedule an appointment. If they will let you, go to the appointment with them. •	If the person is threatening, talking about, or making specific plans for suicide, this is a crisis requiring immediate attention. Do not leave the person alone. •	Remove any firearms, drugs, or sharp objects that could be used for suicide from the area. •	Take the person to a walk-in clinic at a psychiatric hospital or a hospital emergency room. •	If these options are not available, call 911 or the National Suicide Prevention Lifeline at 1-800-273-TALK (8255) for assistance. •	Still skeptical that they can be helped, the suicidal person may need your support to continue with treatment after the first session. •	If medication is prescribed, support the person to take it exactly as prescribed. Be aware of possible side effects, and notify the person who prescribed the medicine if the suicidal person seems to be getting worse, or resists taking the medicine. The doctor can often adjust the medications or dosage to work better for them. •	Help the person understand that it may take time and persistence to find the right medication and the right therapist. Offer your encouragement and support throughout the process, until the suicidal crisis has passed. >> Suicide Risk Factors & Warning Signs from AFSP. >>> Jason spent several days expanding his training and skills in EMDR, a therapeutic tool shown especially effective for those working through issues related to trauma, anxiety, panic, grief, depression, and chronic pain. >>> Mikaela went to a seminar on “Understanding the Gut Brain: Stress, Appetite, Digestion, and Mood,” facilitated by Dr. Merrily Kuhn, which showed the strong connection between what we eat and how we feel. Please contact the office if you’d like to learn more about how we can incorporate these trainings into your wellness program! Reach us by email at info@guidanceforgrowing.com or by phone at (215) 421-1634.